Brenda invested in a new tablet holder from K's Creations for her metal floor stand. This has been available for a while. I was able to find a better photograph at BeStitched. If you use your tablet (or a larger phone) a lot while you stitch, you'll want to check this out. Looks like you can hold the table in either the landscape or portrait position and have it high or low, whatever works with your stitching chair. UPDATE: Jan has one and says it is very easy to assemble. She's also found PDF reader software that allows her to highlight the areas of a chart she has finished. Clever! You've heard me rave about the beauty of Mythic Crafts's slate frames before. Mark builds beautiful frames, boxes, thread keeps and needle minders from scratch. Here's a quick view of the goods. The company has recently moved from Canada back to England, and the costs involved in a relocation mean that Mark's newest products—trestle stands and table frames plus resin cast needle minders—have to wait until he can presell the goods and invest in new tools and materials. So he is going to do a fund raiser and have a massive sale on existing products. Mark is also going to sell slate frames that are finished with Danish oil instead of 8-10 layers of urethane, which is very time consuming to apply carefully, let dry and then sand before the next layer goes on. These will be cheaper and just as well made, but not finished like high end furniture. Now is the time to invest in one of these beauties on sale if you have been eyeing them. The sale lasts until the end of February and will be advertised on Mary Corbet's website tomorrow, so move fast! UPDATE: Mary Corbett has written about Mark and his products and the sale. If you are on the fence, you might want to read what she has to say. © Copyright January 29, 2018 Jane M. Wood. All rights reserved. Want to learn a bit more about the Royal School of Needlework and the various courses they offer? Then you'll enjoy this YouTube video about them. © Copyright January 4, 2018 Jane M. Wood. All rights reserved. You'll love seeing the ornament exchange pieces that Enriched Stitch's staff gave each other. Each is cuter than the next and all were chosen with the recipient's interests in mind. 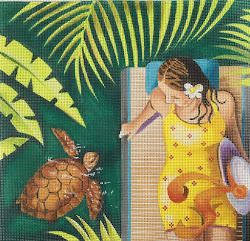 I have a special treat today—an online interview with Lee Ann Estep, who creates amazing original needlepoint designs. The article has two short slide shows and a video, so you can see some of Lee Ann's creations and hear her talk about her work. I would like to invite anyone who is interested to participate in the stitching contest Colorful Amalgam 2018-2019. The contest starts on February, 1st, 2018 and will end on February, 28th, 2019. March of 2019 will be given to finish the carpet (blocking, fringing, or framing, etc…). At the beginning of each month, starting this February, I'll post a part of the pattern of the carpet that is supposed to be stitched during a following month. Each part will be charted with black symbols which are supposed to be "colored" by you. 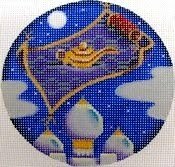 There will be 12 parts with NON-repeatable motifs that will form a gorgeous carpet at the end that YOU painted! There are no rules or restrictions towards this creative concept, but two. 1. The carpet should be stitched on silk gauze. If stitched on 40 count the finished size of the rug will be approx. 6" x 8". 2. 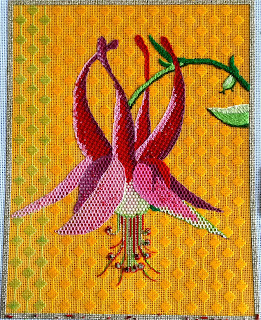 You need to sign up with a Facebook open to public group Colorful Amalgam and post the pictures of stitching progress each month. If you don't have a Facebook account, forward your images to me and I'll gladly post them on the group's page. A winner, that will be chosen by public vote in June 2019, will receive a main prize of $200. I started this rug on 48 count. Let's have fun! It will be so interesting to see rugs with the same design looking different. I hope that folks try this. It's a fun way to celebrate counted work on silk gauze. Nenah Stone Designs has a new series called Animal Angel Ornaments, with a portion of the proceeds going toward animal rescue charities. You can read a bit more about them on Nenah's website. Many thanks to Victori-Anne's Treasures for mentioning this. © Copyright December 29, 2017 Jane M. Wood. All rights reserved. I've just realized that the deadlines for sending in pieces to exhibit at the Woodlawn Plantation exhibition are nearly here! Many thanks to Nancy B. for the heads up. 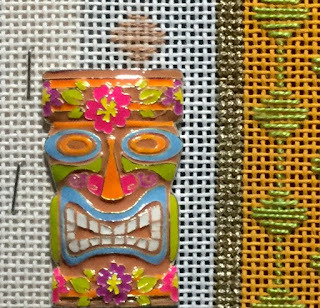 By the way, the folks at the New Jersey Needle Arts chapter took plenty of things to D.C. to show. © Copyright January 26, 2018 Jane M. Wood. All rights reserved. In Style magazine profiles Julia Roberts in this online article. Thanks to Tara, I have a link to a great tutorial on how to make your own display stands or easels for flat backed stitched items. It's clever, it's easy and it is fun to customize your own look with ribbon, buttons, scrapbooking decorations and beads. © Copyright December 26, 2017 Jane M. Wood. All rights reserved. Peggi of Tapestry Fair has collected vintage stitching for years, hoping to turn it into an upholstered chair. And this year she did it! Kudos to you, Peggi. Love the little faces on the arm fronts. Mary Agnes has read this and been inspired to reuse her old shop models this way. © Copyright December 24, 2017 Jane M. Wood. All rights reserved. Lisa from BeStitched has released a free video tutorial on how to make bullions, French knots and Colonial knots. It is very interesting to watch her make all three. Lisa is probably using the blunt point bullion needles from Colonial Needle. You can also get a set of sharp pointed bullion needles from the same source. By the way, if videos really help you more than written material, you might consider subscribing to BeStitched's Needlepoint Flix. Click on Join for all the details about the variety of subscription levels available. You can also read my review of Needlepoint Flix, although I am pretty sure the coupon no longer works. I wrote this in 2015 after all! © Copyright November 15, 2017 Jane M. Wood. All rights reserved. Thanks to the Needlework Retailer, I just heard about Tonkin Threads, a polyester metallic thread from France. It is apparently 4-stranded but I am not certain it can be plied. You can buy individual cards of it from Sajou in France. They describe it as "embroidery floss." In the USA, Tres Chic Stitchery has collections in two colorways. From just looking at the photos Tonkin Threads remind me of Rainbow Gallery's Entice or Gone Stitching's Twinkle although I don't think either of these can be plied. If you try it, do let me know what you think about this new thread. © Copyright December 22, 2017 Jane M. Wood. All rights reserved. 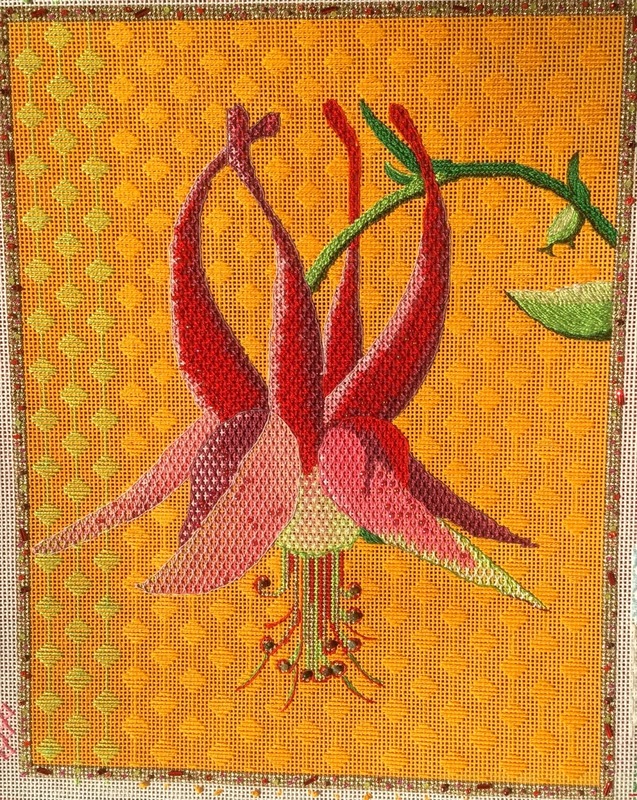 My last project was Barbara Elmore's "Fuchsia," published by Sundance. Isn't it pretty?! 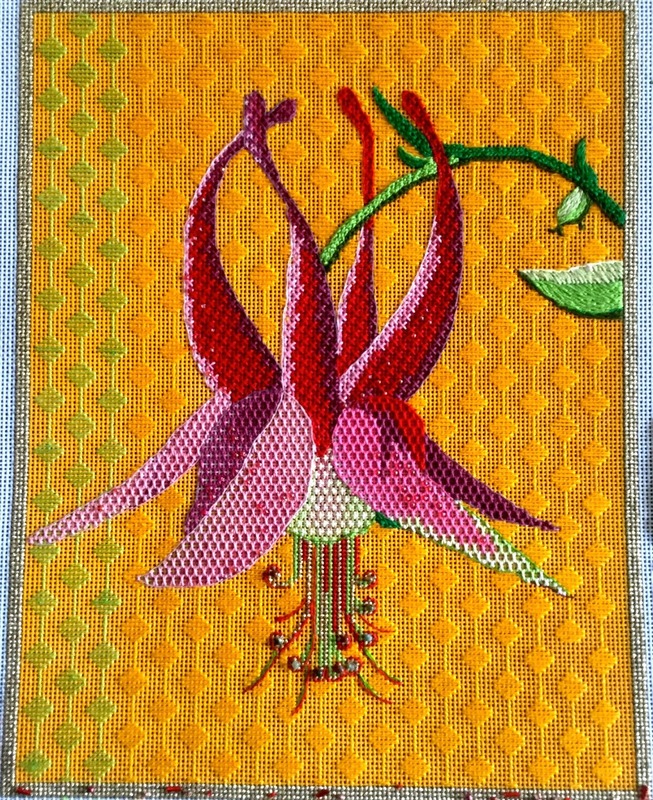 Notice that the border is three gold stitches wide. I decided to tent stitch it with Kreinik's size 16 braid in Kreinik's classic gold 002. I had two spools of the size 16 braid and surely that would be enough, right? Sadly one of the spools wasn't totally full and I ran out of Kreinik size 16 braid when there was only about 6 inches of border to go. What to do?! I had a lot of Kreinik's size 8 braid in 002 gold so I decided I would use a doubled length of that to finish the border's basketweave. The color is exactly the same and the size is exactly half of size 16 braid so I thought it might work. After all, I cannot get Kreinik metallics locally and mail order was going to take nearly a week because of the Thanksgiving holiday. Sadly, the light reflection on the metallic thread is different. 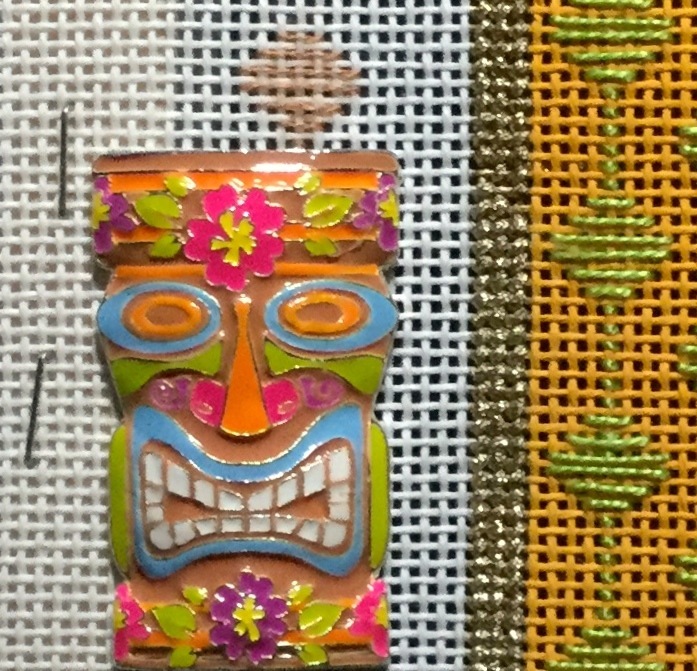 If you look at the closeup of the gold border you will see the size 8 braid above the empty line of basketweave (pretty level with the top of the magnet) and the size 16 braid below the empty line. In person the color change is not quite as obvious as in the photo but anyone looking closely will know that the gold isn't quite the same. Fortunately for me, I had always planned to scatter beads at random on top of the gold border, thus hiding the slight difference in how the size 8 and size 16 reflect the light. So I managed, but if you cannot distract the eye in your canvas, take the time to mail order more of the size of Kreinik you need. You'll be glad you didn't fake it. David McCaskill's new website has gone live! Now you can buy David's line drawn canvases, painted canvases, and charts, plus buy his stitch guides. You can also sign up for his classes in the Hemet, California area. On top of that David explains the different types of needlepoint canvases and eventually will have videos explaining various aspects of needlepoint to his fans. Stay tuned! © Copyright January 18, 2018 Jane M. Wood. All rights reserved. Now that we all survived the holidays, you may be thinking you'd like to treat yourself to something special. My personal favorite treat is a new skein of thread, since I am a threadaholic, but if you are wanting to try some new threads or are looking for a color combo for a new chart and coming up empty, Orna Willis's Adorn by Orna Etsy shop is the place to browse. Personally I think the little $42 packs that come with a free design are a great buy. Here are all her thread assortment packs. But don't miss clicking on All on the left side of the page so you can ogle the bead packs, the Ultrasuede collections, the ribbon collections, and of course, THE DESIGNS. Orna is a master of color so the collections are about as beautiful as any you will find. Thanks, Orna. Now I have to decide what colors are Must Haves. Sigh. Since the article I wrote about how to embellish painted canvases for the ANG website is unavailable while their website is being updated, I have republished it on the Chilly Hollow Stitch Guide Blog. There is also a followup article in another tab with links to online embellishment help and a few tips from me as you tackle your own painted canvas. I hope these articles will help those who are starting to embellish their painted canvases. © Copyright December 16, 2017 Jane M. Wood. All rights reserved. Melita has been making Florentine stars using a Linda Dimianti pattern for gifts. She put them in acrylic trivets, too. I think these are the ones she used. © Copyright December 14, 2017 Jane M. Wood. All rights reserved. Ruth Schmuff has revealed the Winter Mystery class design for this month and next—Dominic Bourbeau's "Cat and Mouse Game." As Ruth posts progress reports, I'll update this article with them so everything is in one place. UPDATE: The cat's head and rear are beaded, then his body mimics the pattern in threads. UPDATE #2: Check out that background and tail! © Copyright December 11, 2017 Jane M. Wood. All rights reserved. Melissa Shirley is stitching Hagatha, one of her witch canvases, and has posted a fascinating tutorial on how she created the witch's hair on Facebook. For those who can't see the above because you don't have a Facebook account, Melissa took four strands of a warm medium gray Silk and Ivory and laid them close together, one bunch of 4 strands at a time, then couching a bundle into position with one strand of the same thread and color with the couching stitches 1/4 inch to 3/8 inches apart. After couching a bunch, use a large needle or sharp laying tool to pull up on the thread bunch between the couching stitches so it looks curly. Melissa says she had to use straight stitches around the witch's earrings and at her hairline with a single strand. I think this would work with any wool or wool-silk blend. It might not be quite as successful with other thread types but this does depend on the look you are going for. Thanks, Melissa! You are as inventive a stitcher as you are a designer! Gloriana's new Pashmina thread is becoming more widely available so I thought I'd post some photos. This is a four-stranded blend of silk and cashmere as you can see in this closeup photograph. I understand with care you can split each of the four plies in half to have eight plies, but I don't know how many plies will work on 18 count. I would start with two and see how it works up as a lot will depend on the stitch used and your personal stitch tension. Needle in a Haystack has photos of most of the colors (Pashmina isn't on the Gloriana website yet). Note that these are overdyes, so there will be some color variation in the skein. Rittenhouse appears to have photos of all the colors up on their website. You have to choose a color and click to see a better photo. The prices vary greatly among all three sites but not all the skeins being sold are the same size and Traditional Stitches is a Canadian shop. I am looking forward to my favorite shop getting some of this in stock so I can try it. I love Gloriana's colors. © Copyright December 7, 2017 Jane M. Wood. All rights reserved. Needle Nicely's Mary Agnes is working the Kimono chart in her shop as a class. Here's a bit about it. Sorry, the Shining Needle Society class mentioned here is long over. There is a lot of outlining to do before starting to fill in the sections, and of course folks make counting errors. Here is how Mary Agnes rips out and then cleans up the line afterwards. Clever! Anna Pearson has posted a list of what she calls "Golden Rules" that will help you create perfect needlepoint on her blog. They are interesting, and thought-provoking, reading. Thanks for sharing your extensive experience with us, Anna! Ruth Schmuff did a little video on how to do Japanese ribbon stitch for one of her mystery classes and shared it with all of us. It's very easy to do, but hard to explain, so this is a very helpful video. Note that Ruth uses the Japanese ribbon stitch to lock the wide 7mm ribbon into the needle and also uses it to create foliage on her canvas. I suspect she is using River Silks silk ribbons as it comes in 4mm, 7mm and 13mm widths and is exceptionally strong. It won't fray as you stitch with it and comes in a huge range of colors. I highly recommend River Silks ribbons. Linda at Split the Needles has won the Smart Cookie Award for January with her Christmas banner. Check out the lettering! It's done with beads on an ombre shading style, with lighter pink at the top of each letter, then a darker pink and finally into the sparkly darker red beads that I expect have an iridescent finish. It is a neat way to dress up letters and something we should all consider for those cute sayings canvases. 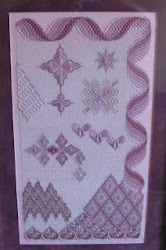 But she also stitches, and choose Carolyn Mitchell's "In My Wildest Dreams" when she was a beginner. This isn't exactly an easy piece for a beginner because the stitches in the original version are on the diagonal, which is not easy for a less-than-experienced stitcher. So Lorraine turned the stitches to make them easier to create her own version of Wildest Dreams using odds and ends from her thread lines. This is Carolyn's original version (bottom of list). If you are new to counted canvaswork, take Lorraine's advice and look for a design where most stitches aren't on the diagonal. But if you fall in love with something that is really more advanced than you are, do what Lorraine did and make it work for you! © Copyright December 4, 2017 Jane M. Wood. All rights reserved. Amy Bunger's latest shop newsletter has a tutorial all about stretcher bars: the types available, the pluses and minues of each type, how to assemble them, now to attach canvases to them, accessories to make using stretcher bars easier, etc. It's a useful resource for the newer stitcher or for someone just interested in how great stitchers like Amy work. © Copyright December 2, 2017 Jane M. Wood. All rights reserved. Quail Run has posted a tour of various pillow finishing styles they've arranged for customers lately. It's a good way to see what types of finishing can be done for your own pillow canvas and also is a great reference to show a shop when you take your canvas to them to have it made up into a pillow. If you don't have any pillows in your life, this is still wonderful to see. The finishing is superb. 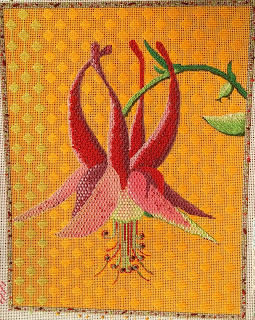 Needlepoint for Fun's latest e-newsletter profiles Elizabeth Bradley's pre-stitched items. If you ever wondered where these were stitched and by whom, you'll enjoy reading this. These pre-stitched pillows, stools, lavender bags and tassel trims are called Elizabeth Bradley Home. The entire line can be seen here. The unstitched Elizabeth Bradley items are located here. The kits are cheaper than the finished items but of course you will have to pay to have them finished yourself if you are not handy with a sewing machine. Look Who's in House Beautiful! Lycette Designs is on the back of the latest House Beautiful (February 2018 issue)! Congratulations, Jessica! Tricia Nguyen talks about design choices using her stumpwork canvas as an example. It's an important lesson—"...in engineering we celebrate these failures as a necessary part of getting to the right answer." Think of Tricia the next time you abandon a project because you are making mistakes. This morning I stumbled across Barbara Suess's temari website again. This is the best website I know about for learning the Japanese craft of making temari balls. I've not been there in a while so of course I did a little browse, aiming to enjoy the gallery of Barbara's finished temari. That's when I stumbled across Barbara's page about Kyo, a thread made from cupro. Cupro is waste from the processing of cotton fibers. It sounds really fascinating! Breathes like cotton but it has the sheen (and the unruliness) of nylon threads and there are metallic versions as well. Here's the link for all those who love tracking down and trying new threads in their stitching. The link to a website that sells kyo doesn't work but I was able to find this Australian site. Kudos to Barbara for all her work introducing us to temari. "Hi Jane! Alas, I need to update my website. Kyo thread is no longer being carried by Ai (the link on my website). However she is carrying another thread that is very similar. It's called Miyako. You can buy a whole set in a beautiful box for color indulgence. Thank you for the compliments on my temari - I'll update that page! Kreinik posted this fun quick interview with the designer Funda Scully on their Facebook page. If you want to see Funda's work, check out her website. With Hedgehog Needleworks closing so the owner can retire, goldwork stitchers need places to buy goldwork threads and supplies. Golden Hinde Goldwork, an English company, is ready to fill that gap. Since I think of New Year's as a time of sparkle and glitter, it seems appropriate to visit their online shop and learn a bit about goldwork today. Once you read the history, click on Shop to see the wonders the shop sells. Don't miss 3 Ply Twists in the Threads section. These are tiny metallic braids, very beautiful as a special touch on your embroidery. Couch them around an angel's halo, use them as Santa's coat trim, or decorate a Christmas tree or swag with these beauties. Happy New Year! Here's to many beautiful threads in our future!